Shop Accessory Geeks online at AccessoryGeeks.com for all the latest and essential cell phone accessories. AccessoryGeeks.com carries mobile phone accessories for Motorola, Samsung, Nokia, Sony Ericsson, Sanyo, LG, Pantech, Audiovox, Kyocera and more. Accessory Geeks has a wide selection of cell phone accessories, cell phone cases, holsters, cell phone batteries, cell phone chargers, cell phone car chargers, cell phone data cables, cell phone charms and more mobile phone accessories. Check back often with 58coupons.com for the latest Accessory Geeks coupons, Accessory Geeks promotions, Accessory Geeks sales and Accessory Geeks discounts. 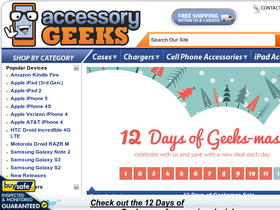 Enjoy 8% off at Accessory Geeks with this coupon code. Click link and save. Enjoy 20% off all wired headsets from Accessory Geeks with this coupon code. Click link to check them out. Get 10% off your order of batteries from Accessory Geeks with this Coupon Code. Click link to enjoy this deal while it lasts. Enjoy up to 90% savings on deals of the week from AccessoryGeeks.com. Click to view deals. Save $15 on purchase of $75 or more from Accessory Geeks with this coupon code. Save $10 on purchases of $50 or more from Accessory Geeks with this coupon code. Get $5 off your order of $30 or more at Accessory Geeks with this limited time code.